- NZD hits ropes as labour data sees market bet on RBNZ rate cut. - Unemployment rises by 9% in one quarter, as the economy softens. - Data undermines outlook for wage growth, inflation and NZD in 2019. The New Zealand Dollar retreated from 2019 highs Thursday after official data showed cracks opening up in the labour market during the final quarter, encouraging speculation the Reserve Bank of New Zealand (RBNZ) could soon be forced to cut its interest rate. 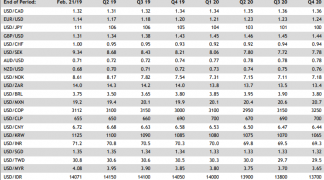 The number of unemployed grew sharply during the final quarter of 2018, rising by 10,000 and taking the total number of unemployed to 120,000, which represents an increase of 9.1% in just the one quarter. Meanwhile the number of employed grew by just 0.1% to 2.66 mn, far less than the downwardly-revised 1% rate of growth seen in the prior period, when economists had been looking for an increase of 0.3%. The net effect of this was to push the unemployment rate up sharply, from 4% to 4.3%, when consensus had looked for the jobless figure to remain unchanged. Wage growth also disappointed the market after the labour cost index rose by just 0.5% for the final quarter and 1.9% for the year overall. The RBNZ needs wages to grow by around 3% each year. "2-year Kiwi swap rates hit a record low of 1.84% following that, with markets pricing in a 66% chance of a rate cut this year: the NZD also dived as a result, catching up AUD," says Jane Foley, a currency strategist at Rabobank. Markets care about the data because of what says about the inflation outlook. Wage growth means greater demand within an economy and higher prices further down the line, which is important for the interest rate outlook. Changes in interest rates are only made in response to movements in inflation but impact currencies because of the push and pull influence they have on capital flows and their allure for short-term speculators. Thursday's data comes less than a week away from the RBNZ's latest interest rate decision and economic update, which could see the bank warn again that the prospect of an interest rate cut is increasing. "The New Zealand dollar was undermined by building RBNZ rate cut expectations overnight," says Lee Hardman, a currency analyst at MUFG. "We don’t believe the labour market is sufficiently weak to prompt the RBNZ to signal they plan to lower rates. However, it should provide more time for the RBNZ to leave policy unchanged. Market participants’ will now closely scrutinise the release of the RBNZ’s MPS next Wednesday." Above: NZD/USD rate shown at daily intervals. The NZD/USD rate was quoted -0.30% lower at 0.6749 Thursday after falling from 0.6900 during the overnight session. It's now up 0.58% for the 2019 year. The Pound-to-New-Zealand-Dollar rate was 0.11% higher at 1.9120 after having risen from 1.8942 during the overnight session. It's now up 0.92% for 2019. Above: Pound-to-New-Zealand-Dollar rate shown at daily intervals. "The market has moved from pricing a small chance of a hike this year to now be fully consistent with our view of a cut by year-end. 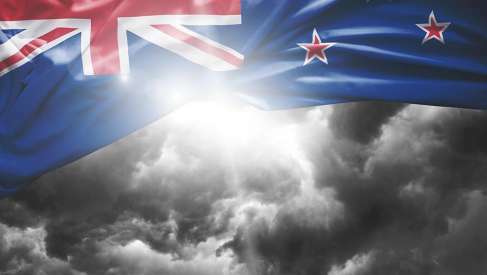 This is an appropriate reflection of the emerging risks, and in our view the RBNZ is unlikely to feel any pressure to send strong signals to the market to ‘correct’ it," says Sharon Zollner, chief economist at Australia & New Zealand Banking Group (ANZ). 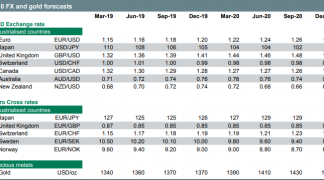 Financial markets have bet increasingly in recent months that the RBNZ could be forced to cut its interest rate in 2019 in order to support a return of the consumer price index into the upper end of the 1%-to-3% target band. Inflation has been trapped in the lower end of the target band for much of the last five years, while economic growth and wage pressures have in recent times, been insufficient to support a sustainable pick up in consumer prices. The Reserve Bank of New Zealand has held its interest rate at a record low of 1.75% ever since the end of 2016, citing below-target inflation and an economic outlook that insufficient to support an increase in rates. 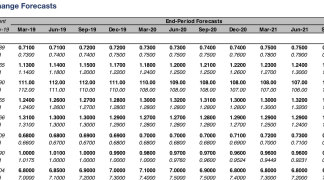 "We are forecasting an OCR cut by year-end, whether the RBNZ changes their growth and OCR forecasts meaningfully next week or not. We expect the economy to continue to fail to accelerate as the year progresses, making the case for easier policy clear in time," says Zollner. That interest rate policy has been a weight around the ankles of the New Zealand Dollar, which once enjoyed he support of interest rates and bond yields that were normally higher than those of developed world rivals. However, four 2018 interest rate rises from the Federal Reserve (Fed), three from the Bank of Canada (BoC) and one from the Bank of England (BoE) have since erased or begun to erode that advantage relative to the U.S. and Canadian Dollars as well as Pound Sterling. Those international interest rate dynamics sent the NZD/USD rate down by more than 7% at one point last year, while also having a significant impact on other exchange rates. 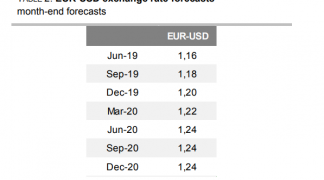 Now, with financial markets looking increasingly for an RBNZ rate cut before February 2020 there is a chance the Kiwi currency may face further depreciation during the year ahead. "The NZD is showing surprising resilience. While it is no longer trading above USD0.70, it has substantially out-performed its peers. We do not see this as sustainable. Like the AUD, there is little domestic story to justify the strength, and the global story is challenging in the medium term. We think conditions are in place for the NZD to fall below fair value," says Daniel Been, head of FX strategy at ANZ. Been says "fair value" is around 0.67 for the NZD/USD rate, although he and the ANZ team are forecasting the Kiwi will fall all the way to 0.61 against the U.S. Dollar this year, while the Pound-to-Kiwi rate is projected to rise all the way up to 2.04 by December. The Pound-to-New-Zealand-Dollar rate was on the back foot Friday, despite gains elsewhere for Sterling, after the Antipodean currencies were lifted by a series of Chinese economic figures that surprised on the upside.